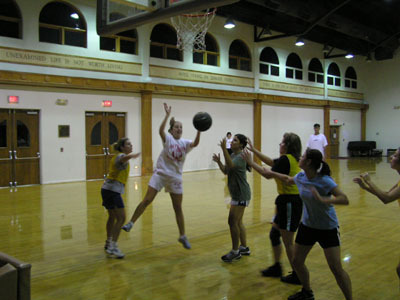 Members of the newly formed Orthodox Women's Basketball team at one of their first practices. The group has already seen an increase in the number of participants in just a few practices. "Who’s your woman?! Find your woman!" For two hours on Sunday nights at St. George over the last several weeks, a group of young Greek women has been chasing, scraping, clawing, sweating, and fighting over something you’re not used to seeing Greek women get all excited about…. a basketball. Yes, you’re right, that a majority of Greek girls play basketball in high school for GOYA, but these aren’t the same girls with the blue ribbons in their hair that played on Sunday afternoons after church. "This was a great idea that should’ve taken form years ago," comments Elenie Rigas, one of the over 15 women that has played on Sunday nights from 8:00 to 10:00 P.M. On the night we stopped in to check out the practice, the women were running a full court five-on-five scrimmage with a few players on both team’s benches to give each other a breather for the two-hour intense practice. Most of these women hadn’t played since GOYA, and were admittedly a little rusty, but the level of intensity and hustle was there. "Hey, Greek girls can jump, or at least elbow each other to get a rebound," says Maria Pratsi, who admits to last playing basketball two years ago, after playing GOYA all throughout high school. Vicky Axarlis adds, "Hopefully, those of us who have not played in a while will brush-up on our skills and we will eventually play in tournaments and win!" She explains, "It’s been a while. I think GOYA is the last time I really played basketball on a team, I just haven’t had time since then." For most of these women, a GOYA basketball connection is there. There are three alumni of St. Constantine & Helen, four from St. Sophia, one from St. George, and one from Annunciation-Norfolk, a frequent participant in DC area tournaments and a host of a popular traveling tournament for DC area churches. "The day and time is convenient and its fun to see our old friends again," says Barbara Ioakim, a St. Connie’s alumni from Silver Spring, MD. Rigas, who didn’t play GOYA, says, "I’ve never played on a basketball team, so I prefer to play with girls I know from the local Greek community. I feel more comfortable learning the ropes from them." 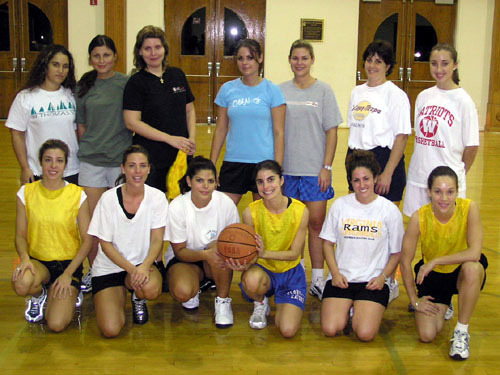 Unlike the guys of the community who have had Greek League for the last six years, pick-up games through the YAL and AHEPA, and numerous non-Greek outlets for playing basketball, Greek girls haven’t had that opportunity until now in the Greek community. 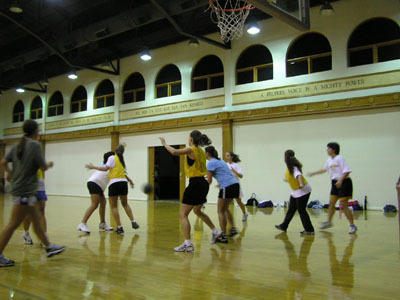 When asked why they would want to play basketball with a group of Greek girls, they gave answers that showed that this is as much about spending time with other Greek girls, as it is about playing basketball. Team organizer, Eleni Nacos, explains, "This is about coming together to form not only a basketball team, but also many important friendships that will last." "Why not?" states team member Athina, "Does it really matter? It’s all for the love of the game and for whatever reason, playing with Greeks holds a special bond, and it helps when you know some of the players as well." "I love being surrounded by people that understand what I’m saying when I speak Greek, especially when a shot is missed," jokes Pratsi. Amanda, from Washington, DC, agrees, "Yelling at each other in Greek makes for a more enjoyable experience. It reminds me of mom." We were stunned to see the Greek girls from Greek Nights, always looking great in their stylish outfits, hair perfectly in place, trade in this classic look for t-shirts, shorts, headbands, and ponytails. As one woman reminded us, "Greek women look radiant when dancing, but absolutely gorgeous when sweating up and down the court." There were no attitudes, no off-the-court competition – just complete camaraderie and sports-womanship. "This community tends to be split for various reasons and these practices are a great way for Greek women to forge friendships, help each other, and get more involved in our Greek community," explains Rigas. Vicki Kappas, of St. Sophia’s, adds, "My goal for the team is to develop new friendships and play basketball in a friendly environment." For all but a couple of the girls, this "friendly environment" would not include making these co-rec practices. (Sorry fellas.) "Being able to eventually play against other Greeks from all over the U.S. was my first intention when forming the team," explains Nacos. She adds, "Maybe a men’s team can joins us in playing at the tournaments, but I think we will stay with just the women at the practices for now." There are three young adult tournaments that the team is gearing up to travel to in the coming months. Axarlis adds, " As far as local recreational leagues, I wouldn’t mind playing in those, but we will see how good we get first." Practices are held at St. George Greek Orthodox church on Sunday nights from 8:00 P.M. to 10:00 P.M. and are open to the women of the Orthodox community. Check out the Events Calendar for more information.